Employees of State Emergency Service of Ukraine have found the two flight recorders at the crash site of the Malaysian plane, but their location has not been given, advisor to the head of Donetsk Regional State Administration Kostiantyn Batozky has said. "Two black boxes have been founded by our emergency teams. I don't have any information as to where these boxes are at the moment," he told a briefing in Kyiv by phone from Donetsk on Friday. As reported, the Malaysian Boeing-777 plane carrying 298 people crashed in Donetsk region on July 17. All on board were killed. The plane crashed on a territory controlled by militants, and they do not allow Ukrainian law enforcers and experts to visit the crash scene. 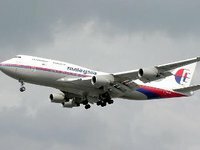 On Friday, July 18, so-called first deputy prime minister of the self-proclaimed Donetsk People's Republic Andriy Purhin said that the flight recorders of the Malaysian plane would be sent to Moscow for examination. On July 19, prime minister of the Donetsk People's Republic Alexander Borodai said that he can't confirm whether the black boxes had been found at the crash site of the Boeing 777 so far. "The objects earlier found by the militants probably aren't black boxes," Borodai said. U.S. has complete confidence in JIT findings on MH17 downing case – U.S. State Dept.